There has been a lot of chatter in Fern Creek about a new shopping center. The developer of SouthPointe Commons has started site work necessary for the shopping center to be built. Not only do roads have to be built, but sewers and underground utilities have to be installed as well. A new traffic signal will welcome guests of the shopping center. Two new safer entrances to Bates Elementary will also be installed. This will hopefully allow for a more steady traffic flow on Bardstown Road. 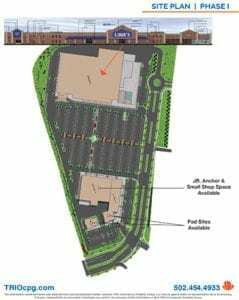 According to Louisville Business First, Lowes will anchor SouthPoint Commons. This will be a great addition to the community. While the new shopping center has brought about a lot of chatter about what additional tenants will be moving in, we can be assured no mater who it is they will be bringing with them an estimated 600 jobs. This is something everyone in Fern Creek is smiling about! Phase I of stores are anticipated to open in the Summer of 2019. SouthPointe Commons will host 363,000 square feet of unique retail with dining and entertainment opportunities. Residents of Fen Creek and beyond will be ready! Elite Homes is currently building in two Fern Creek communities just south of South Pointe Commons. Little Spring Farm is perfect for families of all sizes. From its signature entrance, to the spectacular clubhouse, pool and tennis courts, residents enjoy a truly relaxing lifestyle. Overlooking The Parklands at Floyds Fork, The Villas at Glenmary Village is the perfect garden home community. It offers a variety of floor plans and options you can personalize to reflect your own taste.